Car shipped quickly and was easy to put together. 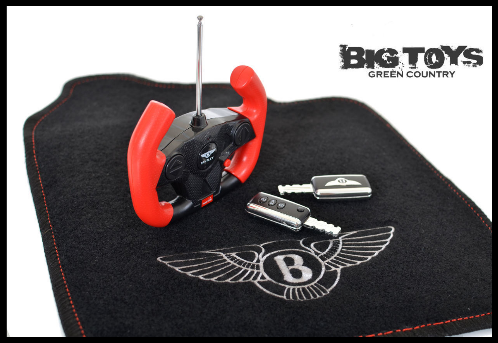 The Bentley keys were a nice touch and remote control works extremely well! I brought this for my Son for his 2nd birthday. He loves it. The delivery was rite on time. I love that it has the Bentley carpet and matching key. This is such an awesome look a like to a actual Bentley car. Great job. I will be ordering another car soon . My 14 Month Old Son Loves It. It was supposed to be a Christmas present but it was too big too hide from him. I took him for a ride in it and he couldn't get enough of it now he has to ride in it everyday. It looks like I will be having to order another one soon since im expecting another son in February. This time I will be ordering the Ferrari or hopefully they upgrade the Lamborghini to 12 volts. Either way my wife and I are satisfied with the customer service from Big Toys Green Country and with my sons Bentley. Thanks Again. Click the button below to add the Official Licensed Bentley Continental GT Ride On 12V Car w/ remote control -Black to your wish list.